If you don't know about this game it's well worth looking at. you will enjoy these games. Since the 1st game my son and husband have been fans. he would do the firing and my husband would move around the game. To play the game you choose a character and place them on the portal. Now the character you have chosen will play in the game. There are different characters is part of an element. For example you have a number of characters that are water. There are parts of the game where you can only get in if you are a water element. As you play the game you earn different things for your character. you can then use all the things you have collected on every game. The characters from skylander spyro adventure can be played on all 3 of the games. The characters from skylander giants can only be played on this and the new game. 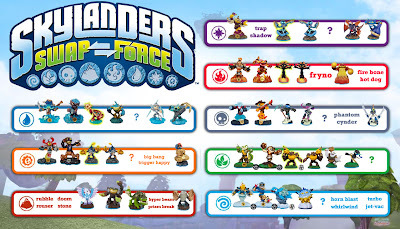 The characters from Skylanders Swap Force can only by used to play on this game. The idea behind the game is fantastic! My son and husband love playing on this game. They can play 2 characters at once or one player can play. You can also buy other items that can help you on your quest through the game. You can have ships, treasure chests and loads of other things. You add them to the portal at the same time as the character. The game is fantastic but be warned!! Once kids get into the game they will want more and more of the characters. I wouldn't like to admit how much my son has spent on characters.